I was fortunate enough to be invited to the Heartfulness Dasara Event in Mysuru. This event is the first of its kind to take place in Mysuru Ashram and so, not knowing what to expect, I packed a duffle bag and began my journey from the hustle and bustle of Bangalore. From what I learned on our train journey, Mysuru is famous for its Dasara celebrations which had become popularized in the 17th century when the King decreed that it would be celebrated with much pomp and festivity. The tradition has continued to this day and during this time, the Palace is illuminated by 100,000 light bulbs and the entire city is decorated and illuminated with colourful lights. 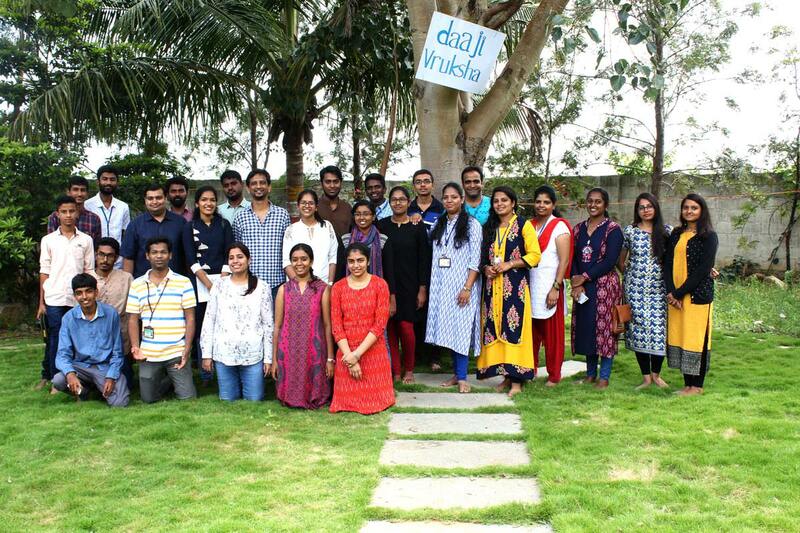 Dasara celebrates the triumph of good over evil and finds its origins in two stories. In the first story, a powerful demon, Mahishasura, who had meditated unwaveringly for several years had been granted the undefeatable power not to be killed by any man or spirit. He then began to wreak havoc on the world. Because of this boon that he possessed, the Gods Vishnu, Brahma and Shiva could not defeat him, and so they combined their powers and created Shakti in the form of a Goddess Durga and empowered her with their weapons. After a war of 9 days she killed the demon, restoring Dharma to the world. In the second story from the Ramayana, Lord Rama killed Ravana, the 10-headed demon who had abducted his wife, Sita. Lord Rama had been accompanied by his brother Lakshman, his follower Hanuman and the VanaraSena. The literal translations of ‘Dasa’-‘hara’ means ’10 killings’, denoting the killing of the 10-headed demon by Lord Rama. 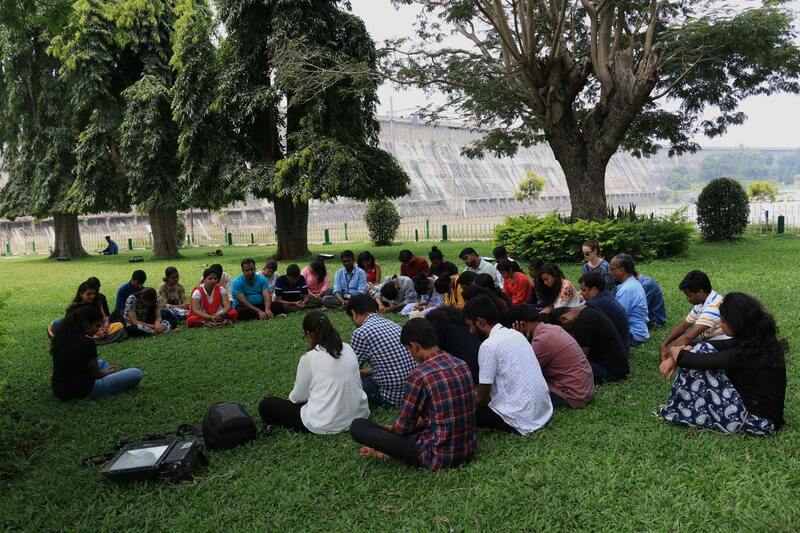 After satsangh and breakfast, we assembled early morning for a briefing of our day. The theme of the weekend, in the spirit of Dasara, was to illuminate the light within and outside. Our mission? To transform this internal light into action and spread joy and kindness wherever we went through a series of orchestrated events. Our uniform was a simple smiley badge affixed to our clothes with the instruction that each person was to give their badge to a new person by the end of the day. We were each equipped with a number of cards which we had created the night before which simply stated, “make a person smile today”. A stack of food boxes stood prepared to be handed out to the diligent service staff and police officers who were patrolling the events. After a quick pep talk we rallied the troops and boarded the bright canary yellow bus that was to be our assigned mode of transport for the entire weekend. We were an army. A kindness army. We took to the Mysuru streets, winding our way up through the Chamundi hills to our first stop – Chamundeshwari Temple. This is where Dasara officially starts with a puja performed to the Goddess Chamundeshwari. The lifeless bodies of tour buses encircled the parking lot with school girls and boys swarming in and out of them. Street vendors with all sorts of food and beverages milled around the area, punctuating the air as they called out their wares. Initially, we all stood sheepishly, adjusting to our environment, not knowing what to do. Then, like making an offering, someone handed a food packet to one of the street vendors who responded in kind – handing a tub of watermelon to one of the children in the group. It had started! From there we scattered throughout the crowd, disseminating food packets, smiley cards and smiley badges to the visitors surrounding the temple. 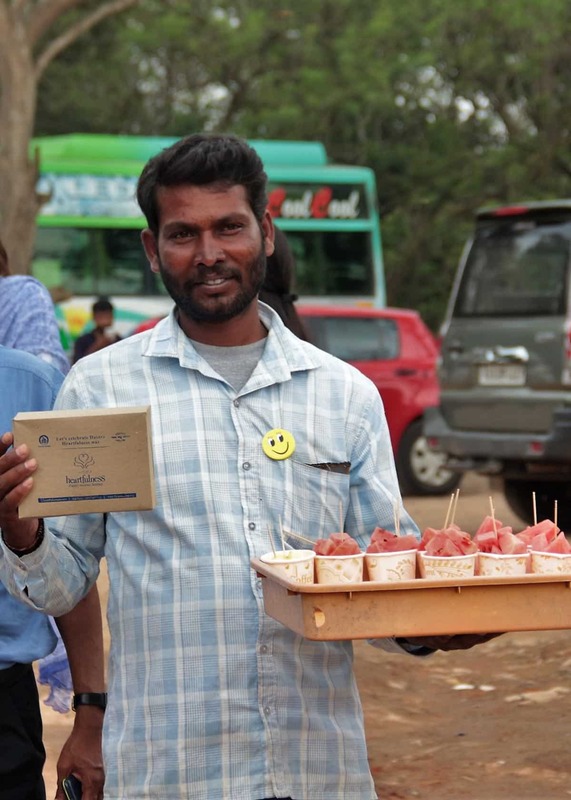 The faces of some street children lit up when they received some food packets and smiley badges. 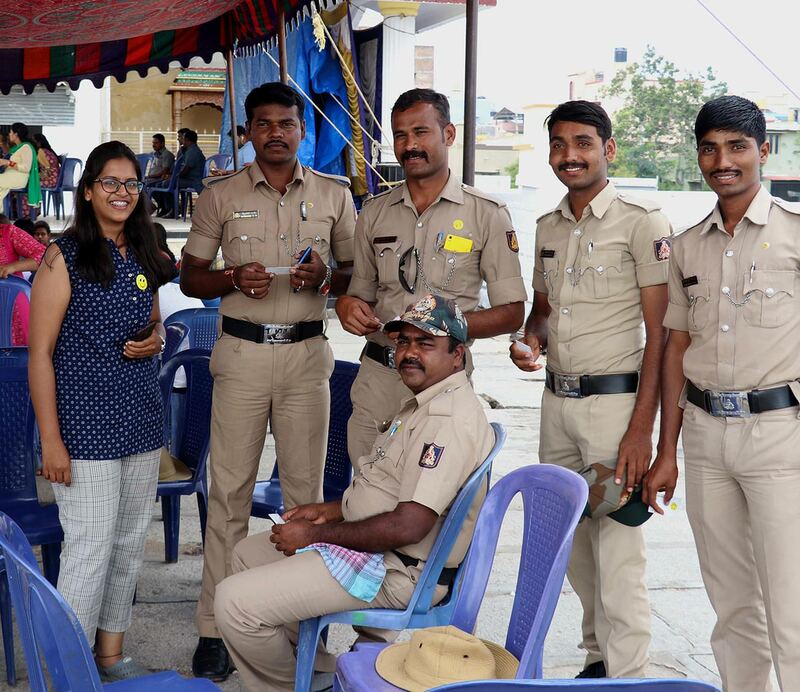 The day had heated up and many of the police officers, bus drivers and service staff were grateful for the water bottle, samosa and cream bun that we gifted to them. When our hands were empty, we regrouped, cleaned up the litter surrounding the bus and headed off to our next destination. Next stop was the flower show, where, in the middle of the venue surrounded by all types of plants, trees and flowers we tested our first meditation flash mob. One person would sit in the centre and gradually more of us would file in and join the circle, fanning out like a human flower of cross-legged, silent meditators. With such beauty and bustle around, it must have been an odd sight to see so many people in silence. When the meditation ended, some people were looking at us with interest and curiosity. Saving the best for last, we arrived at the Mysuru Palace – renown for its elaborate lighting display during Dasara. In the throngs of people, we found some clear areas and again silently conducted another flash mob meditation. This time, several people came and joined the crowd! Afterwards, we spent some time chatting with them about the meditation and Heartfulness organisation. We were treated to a procession of decorated elephants and camels which emerged from the palace entrance before the lighting began. Then slowly, as the daylight began to fade, the lights began to illuminate one-by-one before the palace was completely transformed into a glowing orb of light. Grammy award winning composer and environmentalist, Ricky Kej, played a series of songs inspired my India’s rich environment, all carrying a key message that we must unite to protect Mother Earth and prevent pollution and desecration of the natural environment. When we returned to the ashram, a bonfire was built, and we danced to music in the light of the embers. The following morning after satsangh, we again started out again in our bright yellow bumblebee bus to visit the Brindavan Gardens and the Venugopala Swamy Temple. For a long time, the temple had been lost and submerged under the water. Each piece of the temple had been broken down, numbered, transferred to the new site Hosa Kannabadhi Village and patiently reconstructed in its original form. Outside the shrine of Lord Krishna, we decided again to sit and meditate. More and more people joined us, to the extent that the area became soaked in silence. A mother was overheard telling her son that this must be a tradition in this temple and instructed him to sit and close his eyes and meditate. 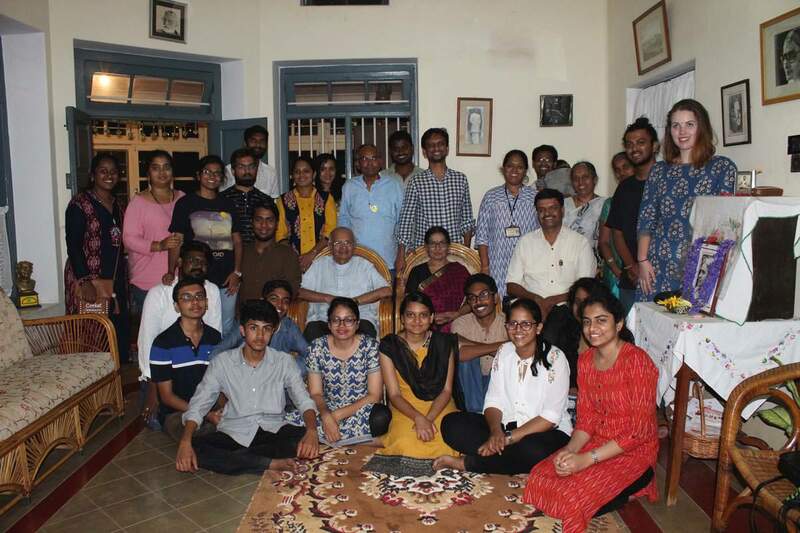 Our final stop was the home of the Kannada poet and philosopher, Kuvempu, where his writing desk and bedroom have been preserved in their original state. Upon entering the house, I felt a deep sense of peace and calm as if the presence of the poet still lingered there. The weekend passed in a whirlwind of activity with little time to process. On the way back to Bangalore I pondered over the learnings from the brief time I spent in an army of kindness. It taught me the power of giving. Like in the example of the street vendor gifting the watermelon to the child, when we give wholly and expect nothing in return, it triggers an avalanche of generosity which reverberates even after the act is completed. It also taught me the value of positive action. Like the mother and her child sitting to meditate in the temple, we internalize what we see, and we copy the actions of others. We must lead by example and be courageous enough to light up – first ourselves – and then the way, so that others may follow. 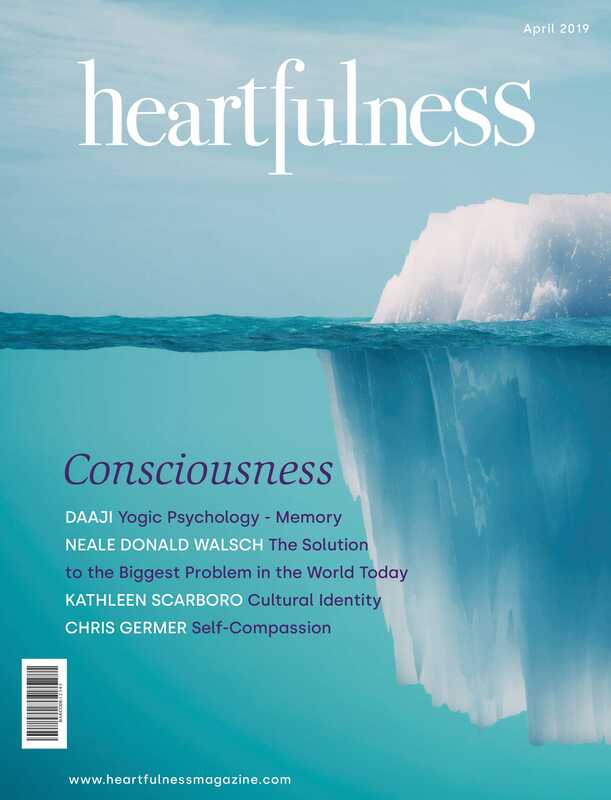 And luckily, the way has already been mapped out for us – The Heartfulness Way. Stories of good triumphing over evil are nothing new and are prevalent in every culture. Customs and traditions of the purging of evil are observed in many forms across the world, momentarily restoring a sense of purification and order to society. By focusing on the external manifestations, we can become distracted and neglect to look inside ourselves. The revolution must start within. Lastly, a sincere thank you to the Mysuru Youth Team for their wonderful planning and hospitality! This is an article by Karen O Neill hails from Ireland. 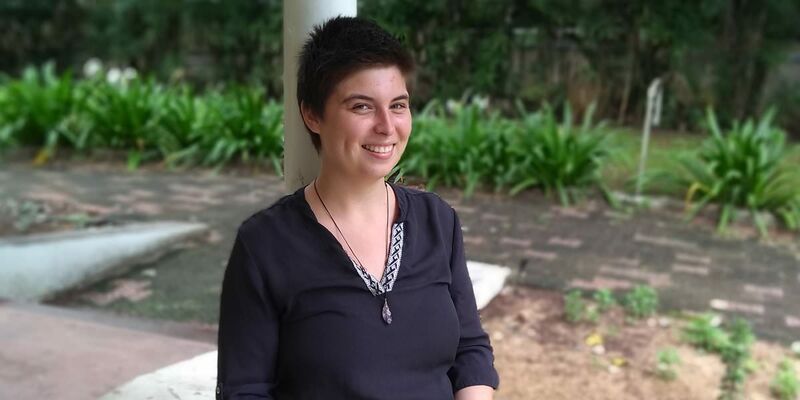 She is currently undertaking a fellowship in Heartfulness meditation and lives in an ashram in Bengaluru, India. 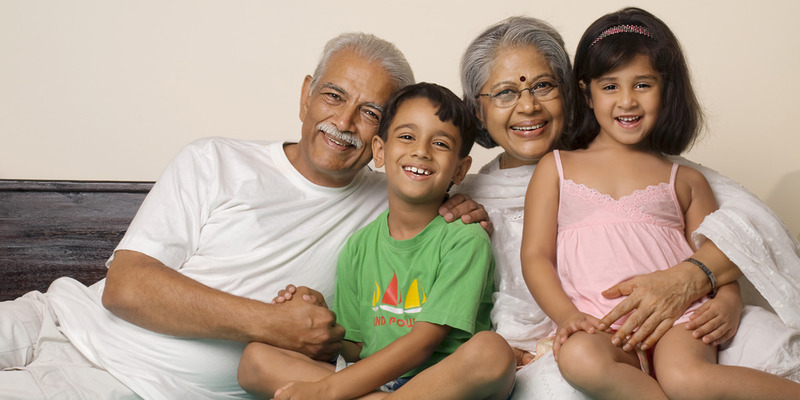 We will use this experience in Ranchi, Jharkhand. Nice initiative. Wow, this is really awesome. While reading I also felt like I was at that event. It’s a magic of act of kindness; it must multiply in billions. Amazing event. I was taken there literally, worth every moment spent. A sure shot way to celebrate the Indian festival. This is Heartfulness way. Beautiful write-up. Keep it up., Karen. Congratulations to you and your team! Service to humanity is the service to the Master. God bless you all. Namaste. 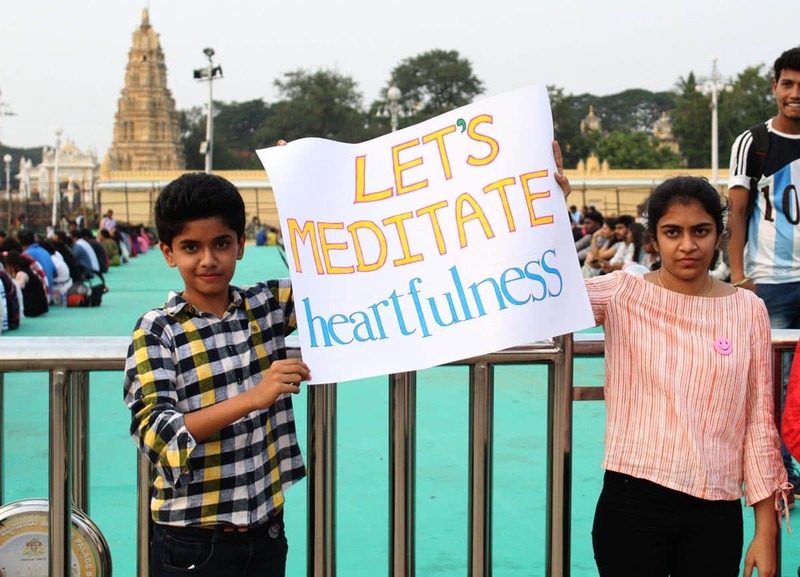 It’s nice to see the grand festival of Dasara being performed under the banner of Heartfulness meditation and spreading its message in Mysore that shows with so much dedication. May the Master bless everyone to grow spiritually, lovingly, harmoniously. May everyone be in good health throughout the journey. Love to all of you. Rajan.K R.
Such a beautiful article. I felt a kind of joy while reading. Nice one. Exploring the inner strength which reflects the art of the “The Heartfulness Way ”. Very nice to hear. Thanks for making such a movement. Thank you very much for this sharing. It is a very beautiful expérience which gives me the idea of reproducing it. All full of Love. Wonderful art of giving, sharing and spreading joy through Heartfulness Meditation.